Heads up: bad tackles are bad news. Melik Brown threw a typical block during a football practice. It didn’t look like much, but he left the field with a concussion. A few weeks later Brown suffered another concussion while making a routine tackle during a game. This tackle also wasn’t one of those crushing blows seen on SportsCenter. 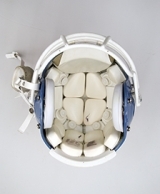 Inside this helmet are accelerometers, spring-like devices that record data from head impacts. 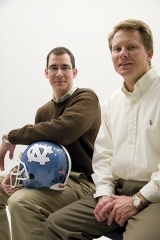 Kevin Guskiewicz, director of Carolina’s Sports Medicine Research Laboratory, videotaped both plays and showed them to then-head-coach John Bunting, who immediately noticed that Brown lowered his head before impact. Bunting and Guskiewicz showed Brown the evidence, trying to hammer home a long-standing lesson — don’t lower your head during a hit. In the second-to-last-game of the season, Brown slammed into an NC State player during a kickoff return. It was a much harder hit than the ones that caused his concussions. But after the play Brown trotted to the sidelines unscathed. Jason Mihalik and Kevin Guskiewicz with one of the test helmets. Click to read photo caption. Photo by Jason Smith; ©2008 Endeavors. Concussions occur when the force of impact to a person’s head causes the brain to move violently against the opposite side of the skull. Headaches and dizziness are the most common symptoms. But concussions can also cause nausea, light-headedness, balance problems, light sensitivity, ringing in the ears, disorientation, blurred vision, amnesia, and loss of brain function. Guskiewicz’s lab is coming to the end of a five-year study of head trauma in college football players. It’s the first research project in the nation to use state-of-the-art technology to study head trauma during live practices and games. Sixty Carolina players use helmets fitted with accelerometers, which are soft, spring-like devices situated between the cushions inside the helmets. When a player’s helmet is struck, the accelerometer records the g-force (a measure of acceleration against the earth’s gravitational pull). In a roller coaster or fighter jet, a person withstands about 4.5g. In a car crash at 25 miles per hour, a test dummy hits the windshield at 100g. In football the majority of impacts fall between 20g and 25g. But hits of 50g to 120g are common, and some approach 200g. Four years ago the National Football League commissioned research in which biomechanists created a simulation experiment with crash test dummies. They estimated that any hit above 85g would likely result in a concussion. Anything below, probably not. “That’s not what we found,” Guskiewicz says. His lab recorded thirteen concussions over five seasons. Six concussions came from hits at or below 85g. The other seven ranged from 100g to 169g. “People see massive hits and think, ‘That’s the one,’ and ignore more trivial blows,” he says. But those less spectacular tackles and blocks can be deceptive. They’re part of what Guskiewicz calls a hidden epidemic. Some players walk off the field feeling a little dazed. If a coach or athletic trainer doesn’t notice, the player might not say anything. But the player could be concussed, and would need to take a breather, and possibly miss several practices and games. 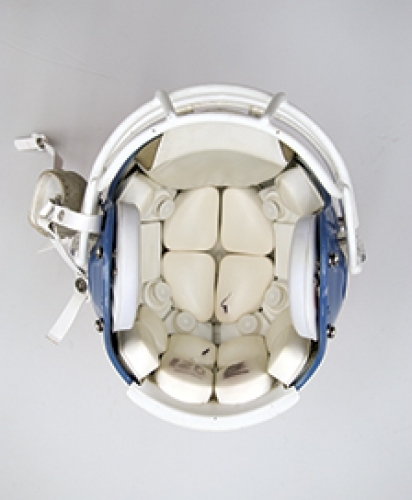 During the study, Guskiewicz’s researchers recorded 104,714 helmet impacts. And they measured many hits above 98g that did not cause concussions. In fact, only one-third of one percent of all hits above 80g resulted in concussions. Other players sustained impacts of 60g and 63g and did suffer concussions. In fact, one Carolina running back who was concussed at 60g had some of the worst symptoms recorded during the study. One probable reason, Guskiewicz says, is that the player took the brunt of the impact on the top of his helmet. Accelerometers also measure the location of each hit — top of the helmet, side, front, or back — and the angle of each impact. The more severe hits are direct, but a lot of tackles and blocks come from various angles. Six of the thirteen concussions came from hits to the top of the head. And two other hits that caused concussions — one to the side and one to the front — were awfully close to the top of the head, too. The average top-of-head impact was 29g, much higher than the average g-force of impacts to the front, sides, and back of the helmet. A player’s lowered head turns a helmet into a battering ram, which can lead to concussions. Guskiewicz also says that helmets were redesigned several years ago to give more padded support to the sides of the head because manufacturers thought players sustained more hits there. But doctoral student Jason Mihalik found that players sustained hits to the sides of the head 14 percent of the time, far less than Guskiewicz expected. They want to study this further, but another round of helmet redesigns might be in the offing. The accelerometers cannot measure symptoms of a concussion. So before the study, Guskiewicz conducted clinical tests on each player to create baseline measurements of things such as balance, reaction time, posture stability, and cognitive function. He also created a way to score the severity of symptoms. The worse the concussion, the higher the score. The four concussed players with the lowest g-force impacts were tested within forty-eight hours of the hits. Each player failed to meet his baseline scores. Oddly, the players with the four highest impacts did not show measurable deficits from their preseason baselines. And their concussion symptoms were not nearly as bad as the running back who was injured during an impact of 60g. All of this tells Guskiewicz and Mihalik that the reasons for head trauma are a lot more varied than researchers previously thought. Athletic trainers and doctors need to be on the lookout for the not-so-huge hit, too. Already, Guskiewicz and Mihalik’s research has had real-life implications not only for Melik Brown but for several other Carolina players as well. During the heat of preseason camp last season some players left the field feeling woozy, weak, and nauseous. But those symptoms can point to dehydration, too. Kevin Guskiewicz, who was awarded a MacArthur Fellowship in 2011, chairs the Department of Exercise and Sports Science and is the director of the Sports Medicine Research Laboratory in the College of Arts and Sciences. He is also research director for the Center for the Study of Retired Athletes. Jason Mihalik is a doctoral student in the Curriculum in Human Movement Science. Graduate student Meghan McCaffrey also contributed to this study. The researchers coauthored three articles for the December 2007 issue of the journal Neurosurgery. The National Center for Injury Prevention and Control funds their study, which is administrated through UNC’s Injury Prevention Research Center.